The Channelers are agents of Seath, who venture out into Lordran for unknown reasons. Robe of the Channelers, sorcerers that serve Seath the Scaleless. ventured to far lands to find suitable human specimens. Helm of the Channelers, sorcerers that serve Seath the Scaleless. The six eyes arranged in two vertical columns compensate for Seath's lack of sight. The Vinheim Dragon School is likely founded upon the following or worshipping of Seath and his sorceries. They can be found in the Undead Parish, The Depths, and The Duke's Archives. Miyazaki: I remember the Channeller's design was put forward around the same time as Smough's and we all took to referring to them as the four knights; Knights C and D, if I remember correctly. I hoped that by doing this, it would ensure that Knights A and B were implemented. In the end they never were, the four knights disappeared and the design work for knights A and B was transferred to other characters like Ornstein and Artorias. The Channeller was given a different role, so that left Smough. According to a common theory, Rhea's location in the Undead Parish after being rescued from the Tomb of the Giants, a Firekeeper's corpse on the altar and the location of the Channeler in the same location line up conveniently for a quite bizarre theory. By the time the player arrives to the Undead Parish Church, there'll be a Firekeeper's Soul on the altar. One of the Channelers, who are known to kidnap women for Seath to experiment on is overlooking this altar. Rhea later appears in front of the altar and if all her miracles are bought and Petrus is prevented from killing her, she can be found hollow in the Duke's Archives. This is particularly interesting because it is known that the Channelers worked for Seath and brought their abducted maidens to the Duke's Archives. It's worth noting that Rhea's mission was to acquire the Rite of Kindling, which is located in the Catacombs/Tomb of the Giants according to their knowledge, thus it is clear that she had no business in the Duke's Archives. While the chronologic order of the above events don't line up (the non-respawning Channeler is there when the game starts, Rhea appears far after he's killed and then ends up in the Duke's Archives), the question still stands: how did Rhea end up in the prison of the Duke's Archives if not for a Channeler? Another valid point is Big Hat Logan's suspected plan; he wanted to study Seath's work and the easiest way to the Duke's Archives was to get kidnapped by Seath's followers, which can potentially support Rhea's abduction, too. Lautrec was likely captured by the Six-Eyed Channeler found in the area near him. 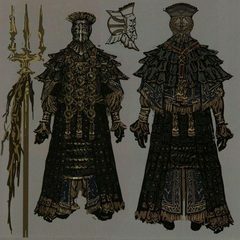 It may have been his plan as we know the Channelers take their captives to the Duke's Archives in Anor Londo (similarly to how Big Hat Logan got himself captured to enter the Archives), a destination Lautrec might be seeking to visit, considering he has a "pressing matter to attend to up above"
Alternatively, Lautrec may have been there for a very long time, evidence for this is that the entrance to his cell has been boarded up (albeit shoddily). In the chapel below we see that someone has killed a Firekeeper upon the altar to the statue depicting a woman holding a baby. Perhaps, this was Lautrec's handiwork; it's clear that Lautrec is not averse to killing Firekeepers. As a final note: if Lautrec had been locked in the cell by the Channeler, it would make sense for the Channeler to be holding the key, and yet he does not (though he is not very far from it).